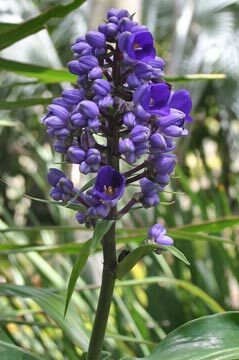 A rare and striking plant with vibrant purple blue flowers in the summer and autumn. It is not actually a ginger but has glossy dark green leaves on clumping ginger-like stems that can be trimmed to the ground each winter, or left to die down naturally. Perfect as a pot plant, or in a shady moist spot to add colour in the lower levels of your tropical themed garden. The bright colours mean it works well as a single specimen or a massed display. Full sun to part shade. Originally from Brazil, very easy to grow in Australia in temperate to tropical areas (protect from frost - or cut down and mulch heavily before frost hits). Stems will die down in drought to re-shoot in better conditions.